As we walked the sky looked like more rain was imminent, and sure enough by the time we got to the Lincoln Park Pool it started to sprinkle and then drizzle. But the shower wasn’t unpleasant and was not accompanied by thunder and lightning. So it looked like the race would happen as scheduled, but would anyone show up besides us? 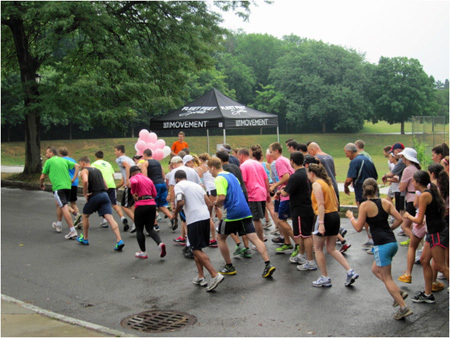 You see, we had only learned about the 1st Lincoln Park Pool 5K Run For Breast Cancer two days earlier. Some mysterious someone who turned out to be our alderman had dropped off a City of Albany issued pamphlet at our door. It looked like it had been done hastily like at the last minute, full of blank spaces like someone didn’t have time to fill them, or perhaps because there were some last minute omissions from the program. I couldn’t find an announcement for the race on the City website, it didn’t come up on google. 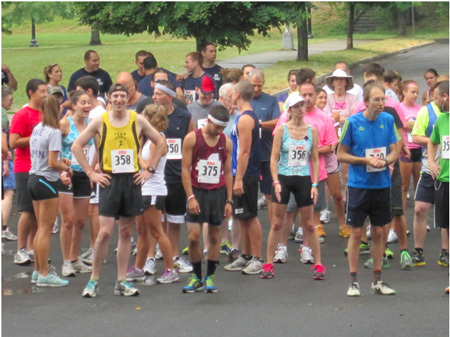 I did see announcements on several racing websites under the heading “Capital Region 5K runs.” So word had gotten out about the race, but not in the nearby neighborhoods. I attempted to rectify this problem by sending out an announcement on nearby neighborhood email lists but it was pretty late for publicity. As we approached the pool I could see what the Wife had told me, that the deck in the middle of the pool (which we are no longer allowed to climb on) had been painted with the famous breast cancer pink ribbon. Also, according to her, the red circular lap line under the water had been sloppily covered with pink paint. Obviously this painting had been done before the pool was filled with water in June. Very interesting. The pink ribbon is actually a proprietary trademark of Susan G. Komen For The Cure, and legally can only be used with their permission. Indeed, last year Komen had been filing lawsuits against small local non-profits, municipalities and the like, as part of a push to gain economic control of the pink ribbon. And we all remember how Komen tried to shut down Planned Parenthood by suddenly defunding their very extensive breast screening program. By March of this year the upper middle and wealthy class donors to Komen from all across the nation reacted angrily to this childish politicking and almost completely withdrew their support. Overnight the supposedly non-profit Komen became regarded as a sleazy corporate predator by the general public. Which is precisely what Komen had become, having been completely taken over by scam artists. By April “Komen” had become a toxic brand name. So what the hell is this proprietary pink ribbon for a much hated sleazebag corporation doing in the middle of Lincoln Park Pool in July of 2012? When we arrived at the Pool House a warm, steady light drizzle was coming down, which was rather pleasant. 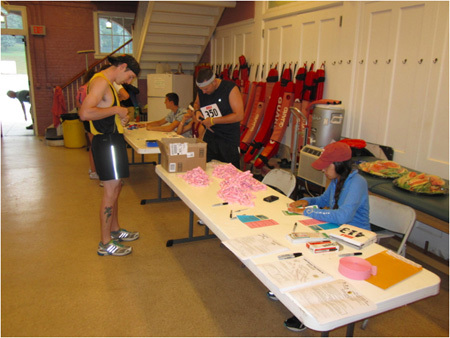 Registration for the race was already underway, it looked like we were not the only ones. Most of the participants were waiting out the light rain on the Pool House porch. The Wife was very disappointed that Albany mayor Jerry Jennings didn’t show up like He usually does at such events. That’s too bad, I had resolved the night before to write nice things about Him (for a change) for bestowing His favor upon our neighborhood and Lincoln Park Pool. So much for that. At the very least The Wife expected to see John D’Antonio the commissioner of Parks and Recreation who would have been in charge of this event. In fact our alderman, Common Council member Dominick Calsolaro was the sole City representative to show up. We found him standing in the rain with a black umbrella, but when we arrived he moved onto the porch where he greeted the occasional constituent. The Wife went inside to register. The inner sanctum for the pool lifeguards was used for registration. I could see bits of pink detritus, pink tickets, pink rubber wristbands, even pinkish slices of watermelon all ready on dishes. Outside at the starting line we had pink balloons tied into the shape of the proprietary Komen ribbon. But not one single direct reference to Komen anywhere. They gave The Wife #411 to pin to the front of her shirt. “Is that how many people are registered for the race so far?” she asked enthusiastically. Sheepish smiles, well, um, no. But by then the porch was getting crowded, it looked like we had a race. 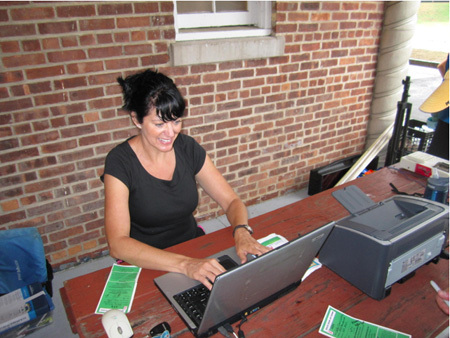 I chatted with the lady who was in charge of keeping straight the race statistics and such. I told her that we had only got word of the race on Wednesday and she replied, “So did we. The City hired us on Wednesday.” So this foot race, which had been planned for months was actually organized only three days earlier. Most curious. Foolishly I didn’t get her name, it looked like she was doing all the work. She was from Right Timing, a small business that runs races like this. When I told her I was blogging, she said, “Mention that the company is run by Glen Wolin,” her boyfriend. I have a theory about all this. Mind you, I have no confirmation, such as a City official telling me, “Yeah, that’s about what happened” or something like that. But I do have plenty of corroborating evidence, and a theory is only as good as it fits the observable facts. 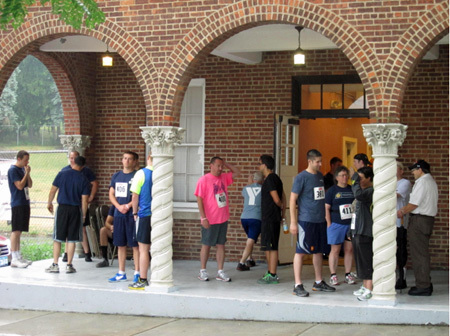 My theory is that sometime last year the predators at the Susan G. Komen For The Cure corporation approached the City of Albany (that is, approached Jerry Jennings) with a sponsorship fundraising proposal centered around a 5K race. As we all know, Jerry likes to roll with corporations bristling with cash, so He was probably enthusiastic about the proposition. 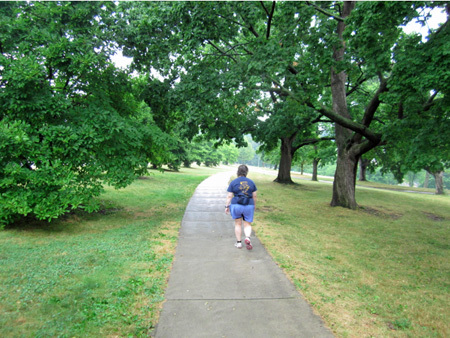 Unfortunately, the only City venue available was neglected Lincoln Park, but our neighborhood would do in a pinch. But by the time this past Spring had sprung, Komen had become a dirty word and no one wanted to associate with them, certainly not elected officials who depend upon a positive public image to stay in office and pay their bills. So by April Fools Day Jerry wanted nothing to do with them. There was a definite ad hoc feel to the event that was not the fault of the contractors who ran the race. 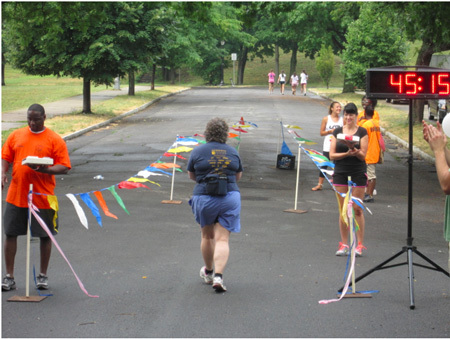 For example, the City always paints a finish line on the pavement for such races, but there was none. Nor were there markers along the route, and the one banner proclaiming the City’s benevolent sponsorship was general in nature. A firetruck showed up to do EMS if necessary, that’s required. First the guys tried to park the truck on the race route, but then they were persuaded to park it off to the side. But then the contractors who ran the race deferred to the FD guys and asked them to blast the truck siren to start the race. So one of the guys said okay, and without warning went into the truck and hit the siren. 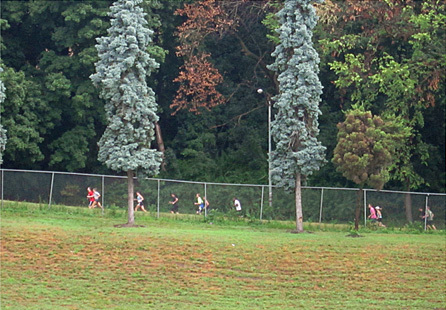 Taken by surprise, the startled runners took off in a pack. They didn’t get to on your mark get set go. After Komen became a dirty word their revenue, which was almost entirely charitable contributions, dropped precipitously and the corporation went into crisis mode. 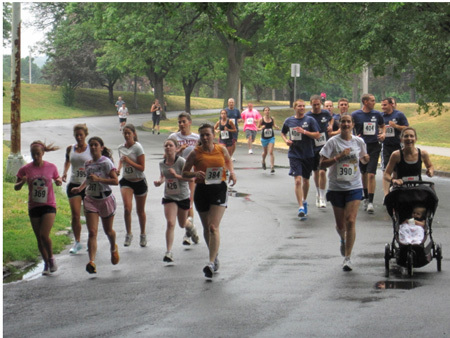 By late spring their Bottom Line was in deep trouble and the corporation no longer had the time or resources available for expansion projects like a 5K race in some noplace like Albany. So either they withdrew their sponsorship or else Jerry told them to get lost and they gladly took a hike. But the administrative bureaucracy of the City of Albany, you see, is not organized like other municipal governments. Each department exists in a separate “silo,” each department communicates directly to the mayor but not to each oher. If they want to talk to each other they have to do it through the mayor. That’s why Jerry needs a deputy mayor with a salary second only to His, and that’s why until very recently He has successfully resisted the implementation of a modern interdepartmental computer system. The purpose of this manner of organization is to make the mayor the hub of all power. That’s why some people like to say that Albany has yet to catch up with the 20th Century. Lincoln Park is basically a giant flat bottomed bowl surrounded by killer steep hills. 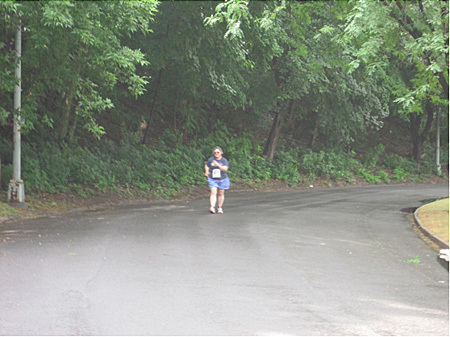 The race route was four times around the bottom of the bowl, each time around detouring up then down the hill that leads to the ML King Boulevard entrance to the park. 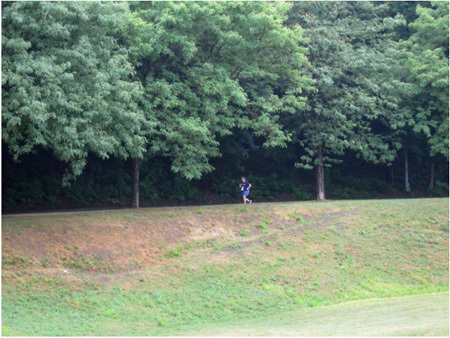 All but the healthiest runners, I noticed, tightened their jaws grimly when they regarded that incline. Very quickly the lead runners were lapping the slowpokes. I walked the bowl once, at about three quarters of my way around I asked a passing fellow who was trotting along easily, which lap was he doing. “Last,” he said, and stepped up his speed in the home stretch. 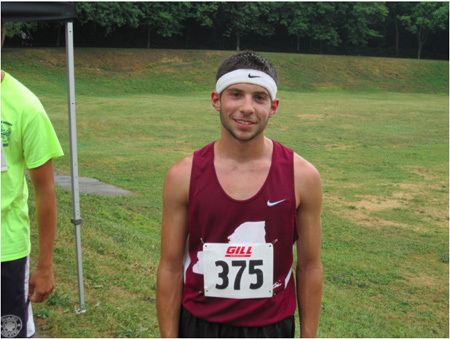 The winner was Philo Germano of Albany who came in at an astonishing 16:20, he didn’t look sweaty or winded in the least. The first female, who I didn’t talk to, was Emily Finnegan at 17: 47. Not to diminish their accomplishments, but I have to wonder if we really had exactly 5K (3.1 miles) laid out, I suspect it was a might short. Then again, for all I know the route may have been a might long. Laying out the route is the City’s responsibility, it’s too bad they had no time to do it right. The haste in preparation takes away from the accomplishments of the winners, but who cares. People had showed up and paid ten bucks to run in the early morning mists, not win big prizes and bask in lasting glory. So what I think happened is that the mayor forgot to tell all the different departmental silos to cancel the race. However, some efficient City worker embedded in one of the silos had already informed the wider racing community about the event and the notice had been posted on several online lists of race announcements. 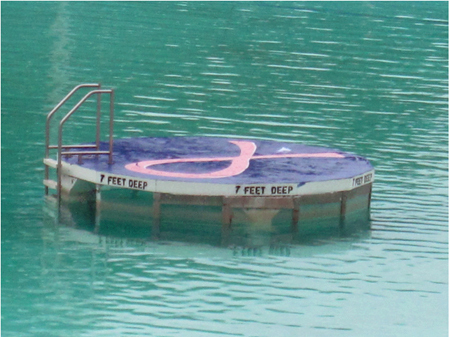 And He appears to have forgotten to tell the Department of General Services (DGS) silo to cancel the order to paint a pink Komen ribbon in the center of the pool. My theory is that four days before the race someone brought all this to Jerry’s attention, that people were expecting a race on Saturday, there was a pink ribbon in the middle of Lincoln Park Pool and something had to be done. Actually, I was impressed how the City handled the crisis, things went off rather well considering. I mean, screw-ups are bound to happen even if you have 21st Century bureaucratic systems in place. If Jerry had showed up at the start of the race like He usually does I would have praised Him for managing to pull off the race without debilitating glitches, but alas, He did not show His face to us that morning. I guess He didn’t want to get too close to that proprietary pink ribbon in the middle of the pool. It looked like the entire squad of Lincoln Park Pool lifeguards participated in the race, both top winners were lifeguards. I observed their esprit de corp. The pool lifeguards have always had their own workplace identity but this was different. These physically fit young guys and gals appeared to me to identify with each other, they were friends. One year ago I wrote about how the pool was sadly neglected and underused and wondered why the City saw fit to do that. 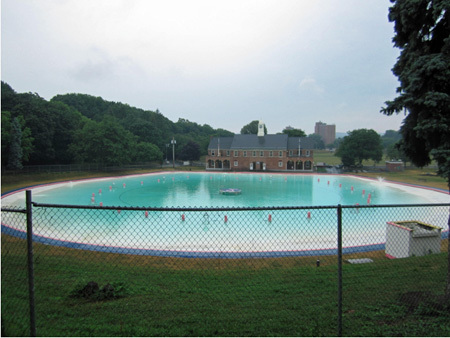 With the Demolition By Neglect and imminent shutdown of the indoor pool at nearby Bathhouse #2, at the time it looked like Lincoln Park Pool was next for elimination. But since June of 2011 we have seen a massive change of official attitude toward Our Pool. It seems that the City has re-instituted the long-abandoned program to recruit lifeguards from Albany High School. Also, this event was the first time I’ve seen these orange “Ranger” t-shirts at the pool, apparently some sort of apprenticeship program about which I have to learn. There is now a running club centered in the Pool House, and of course the weight training program upstairs. And most importantly, this year we have swim programs for neighborhood kids sponsored by the Red Cross. This is clearly in response to a recent report that inner City black kids are three times more likely to die by drowning than suburban white kids. All this indicates that the City has reversed it’s policy of Demolition By Neglect and now recognizes our pool and our park as a valuable resource that they can, um, exploit. I learned about these new programs from a troll who posted a sarcastic comment a few weeks ago on an old article about the pool on this blog, from one year ago. The troll claimed to be a high school student who worked as a lifeguard but that person sure didn’t think or write like a teenager. I suspect the troll is a City official. Still, I’m grateful to read the flame, I’m delighted to see the City is relenting and letting us use our pool again. So The Wife trudged along like a snail in the mud. 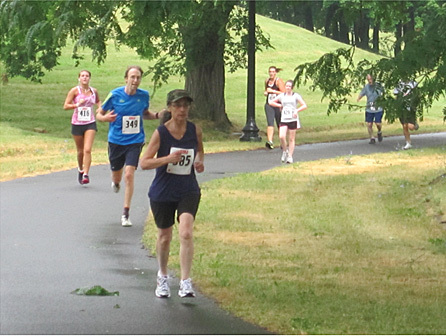 You would not think to see her crawl through Lincoln Park that this slug had done the Pine Bush Triathlon the previous weekend, swimming, bicycling and running. Okay, in that event she swam like a bag of concrete, biked almost as fast as a toddler on a tricycle and ran like a three-toed sloth wearing flippers but she was not the last participant to finish, far from it. She liked my passing idea for a Lincoln Park Triathlon. Admittedly the park is a little too small for such an event, for instance you really need a lake to accommodate all the participants. But she didn’t care about that, she was all ready to sign up and jump in the pool and start competing. Lincoln Park is wide open, standing at the bottom of the bowl you can survey everything. We could all see The Wife’s trudging exertions in her bid for last place as she slowly rounded the bowl. 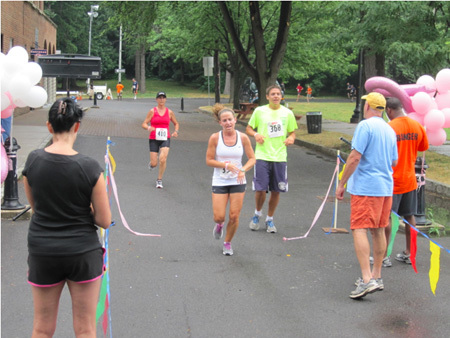 Still, some of the race participants waited to encourage her across the finish line, that’s not unusual. Foot racers tend to be very supportive of the last ones to finish. Finally she streaked into home to cheering. Even the slowest slow slugs get praise and support at these things, even if it takes them more than 45 minutes to cover a 5K. Hey, you didn’t see me run, so I’ve got no right to complain. In total there were 92 entrants for the race but only 70 actually ran. 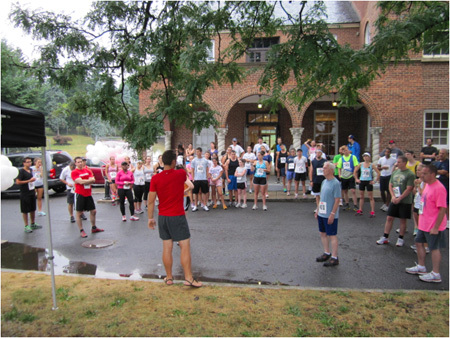 I guess 32 people who signed up ahead of time were scared of the warm light occasional rain, but I’ll have to say that this race had close to perfect running weather. Experienced runners actually welcome such conditions. So here it was not even 10 AM and now The Wife announced to all the lifeguards standing around that she was ready to jump into the pool. But see, the pool didn’t open until Noon so she was out of luck. That, she explained to the lifeguards, is why we need to have a triathlon in Lincoln Park. The lifeguards looked like they thought that might be a good idea. Click Here To See The Fabulous Prizes! I should do one of those, once I lose enough weight that my left knee isn't killing me. National did screw up this past winter but they say the error of their ways and ousted the right wing nut that did not like Planned Parenthood. Thanks, Al, I hadn't known (or completely forgot) that Komen had been running an annual race on the Plaza. According to the brochure, all the proceeds go to Albany Med. A slight inaccuracy in the article is that Komen has not sued to control the plain pink ribbon. Instead they have a proprietary version of the pink ribbon that has a pink dot over it. What they mostly sue over is the phrase "For The Cure" which they copyrighted. So presumably Mayor Jennings is quite aware of the okay legal status of the dotless pink ribbon in the middle of the pool. But Komen appears to be coming back big time. Last weekend I saw a big billboard advertising an upcoming Komen sponsored 5K in Vermont, and this past Saturday I saw a robust Komen table at the Troy Farmer's Market with lots of pink souvenirs for sale. I sure hope the pack of "right wing nuts" have been kicked out of the organization and never appear again. We'll see.